Among many interesting features, Servlet 3.0 introduced annotations that make deploying Servlets, Filters and Listeners of all types easier. Most of the WebServlet annotations are packaged under javax.servlet.annotation. In this post we’ll see the following annotations. WebListener, WebServlet and WebFilter annotations are placed on classes implementing respectively Listeners, Servlets and Filters. The WebInitParam annotation is used with WebServlet and WebFilter annotations specifying Servlet and Filter initialization parameters. In order to provide support for these annotations, the mechanics of WebApp loading has to become a bit smarter. When an application loads, all classes comprising the application are examined for presence of the annotations. When these annotations are found on a particular class, the container registers instances of the classes as Listeners, Servlets, or Filters. @WebListener is the easiest to use. The type of listener is deduced from the list of interfaces that the class or its super class implements. If the class annotated with WebListener does not implement any of the listeners an error message will be logged. @WebServlet annotation is used to register a Servlet with a container. Below is the complete list of attributes that annotation encapsulates. The attributes are simply bits of data that prior to Servlet 3.0 would go into <servlet> or <servlet-mapping> tags of web.xml. Now they can be specified in java code. Note: the spec mandates either value or urlPatterns attribute be specified. After the successful build, a compile class will be created in WEB-INF/classes folder.Accessing http://localhost:8080/sample/hello should render the below text (‘sample’ is app name here). The @WebInitParam annotation provides a means of specifying initialization parameters for servlets and filters. As mandated by the spec Resin expects that value, urlPatterns or servletNames will be specified. Metadata specified in WebFilter are available via FilterConfig object, so the output of http://localhost:8080/sample/hello will render the following output. Congratulations - you have completed Servlet Quiz. In which file do we define a servlet mapping? Servlets and JavaServer Pages have become so popular that they are now supported directly or with third-party plug-ins by most major Web servers and application servers. What is the limit of data to be passed from HTML when doGet() method is used? Which of the following can be used to store client side user state information while avoiding any impact due to the users web browser configuration ? Which of the following is not true about Servlets? Using relative paths to reference resources in the same context root makes your Web application more flexible. How many ServletContext objects are available for an entire web application? 1. Servlet is a  Java technology based Web component. 4. Servlets interact with Web clients via a request/response using HTTP protocol. Servlet A receives a request that it forwards to servlet B within another web application in the same web container. Servlet A needs to share data with servlet B and that data must not be visible to other servlets in A's web application. In which object can the data that A shares with B be stored? The HttpServletRequestWrapper can be used to extend the functionality of a servlet request. An HttpServletRequestWrapper may modify the header of a request within an object implementing the javax.servlet.Filter interface. When the container initializes the servlet it makes a unique ServletConfig for it.Its main job is to give us init parameters. The container reads the servlet init parameters from the Deployment Descriptor and gives them to the ServletConfig and then passes the ServletConfig to the servlet’s init() method. This method returns a String containing the value of the named initialization parameter,Return value will be null if the parameter does not exist. This method returns the names of the servlet’s initialization parameters as an Enumeration of string. This method will return an empty Enumeration if the servlet has no initialization parameters. This method returns a reference to the ServletContext in which the caller is executing. This method returns the name of this servlet instance. Servlet name can be assigned in the web application deployment descriptor. In case you want to put a certain value (an email address for example) in your servlet, a better option would be to configure it in the Deployment Descriptor(web.xml) rather than hard-coding it in the servlet class. The getInitParameter() can be called on the ServletConfig object to return the init parameter but only once init() is called. Here we are going to discuss about SingleThradModel in Servlets. As we know that servlets are server side components that help us for developing web application on server side. Servlets are used to process multiple requests simultaneously. instance is shared across multiple clients. As single instance is shared by all clients so there are chances that same instance variable is modified by many clients and hence giving undesirable result . To avoid this concurrency, we use SingleThreadModel. By default servlet is multithreaded . Single Thread Model ensures that servlet handles only one request at a time.When your class is implemented SingleThreadModel no two threads run simultaneously in service() method . created for each client request.It is also called thread safe. It is a marker interface which does not have any body. Single thread model is not used generally as it slow down the performance and increases overhead as new instance of the servlet is created for each and every new request. updateString = "update Persons set name = 'shobhna' where id=12"
Note that SingleThreadModel does not solve all thread safety issues. For eg, session attributes and static variables can still be accessed by multiple requests on multiple threads at the same time, even when SingleThreadModel servlets are used. This is the main reason due to which SingleThreadModel is deprecated. This interface is deprecated in Servlet API version 2.4. We can use Synchronized block and synchronized method to obtain threadsafe Servlet. Before we start let us first discuss what is servlet. Servlet: Java servlets are server side components that are used for developing server side programs that runs on a server. Generic servlet as name suggest doesn’t depend on particular type of protocol . In other words, generic servlet is a protocol independent servlet. thus,it contains only the generic features which a servlet should have. It is an abstract class as it contains one abstract method service(ServletRequest request ServletResponse response). This is an abstract class, So it is required that all the subclasses must implement service () method. Let us Consider the following GenericServlet example. service(ServletRequest req, ServletResponse res) : This method is called by servlet container when a request is invoked by the client,after that request of client is processed by the servlet and response object is returned to the client as a result. It is the service method where we write our business logic.In addition to service method generic servlet has some more methods like log, init and destroy. This method is used for writing messages to log file. This method is used for destroying servlet. HTTPServlet is an abstract class extends Generic Servlet and as a result inherits properties of generic servlet. It is defined in “javax.servlet.http” package .HttpServlet is a HTTP protocol specific servlet. In HttpServlet mostly doGet() or doPost() methods are needed to be overridden to handle the GET or POST requests. In order to create a Servlet , a class should extend HttpServlet and override goGet() and doPost() method. 1)The main difference between Genericservlet and HttpServlet is , GenericServlet is protocol independent and HttpServlet is protocol dependent. 2)HttpServlet have methods that support cookies and session where as GenericServlet doesn’t have. 3)GenericServlet do not have doGet() and doPost() method while in HttpServlet you have to override atleast one method doGet() and doPost() . 4)GenericServlet is a superclass of HttpServlet. 5)GenericServlet is an abstract class so you have to override Service method where as in case of HttpServlet you have to override at least one method of doGet(), doPost(),doPut(), doDelete(), init(), destroy(),getServletInfo(). Servlets are server side programs , they are request and response oriented program. Suppose you enter something in the form and submit it, Then who is processing your request ? Someone has to pick up the details you have entered in the form. Servlet is the server side program which handles all the request and redirect to the result page. What is the difference between getSession(true) and getSession(false) ? When you say getSession(true), this method will check whether already a session is existing for the user. If a session is existing, it will return that session object, otherwise will create a session object explicitly and return to the cilent. When you say getSession(false), this method will check whether a session is existing. If yes, then it returns the reference of that session object, otherwise it will return null. What is load on startup element in web.xml file ? We can specify the order in which we want to initialize various Servlets.Like first initialize Servlet1 then Servlet2 and so on.This is accomplished by specifying a numeric value for the <load-on-startup> tag. <load-on-startup> tag specifies that the servlet should be loaded automatically when the web application is started. The value is a single positive integer, which specifies the loading order. Servlets with lower values are loaded before servlets with higher values. ServletContext is for the whole web-app but the ServletConfig is for one particular Servlet. The ServletConfig parameters are specified for a particular servlet and are unknown to other servlets. The ServletContext parameters are specified for an entire application and are available to all the servlets within that application. The forward method of RequestDispatcher will forward the ServletRequest and ServletResponse that it is passed to the path that was specified in getRequestDispatcher(String path). This method is useful for communicating between server resources. Because the request and response are forwarded to another resource all request parameters are maintained and available for use. In case of sendRedirect(String path) method the client will build a new request and submit it to the server. All previous parameters stored in the request will be unavailable. The client’s history will be updated so the forward and back buttons will work. Servlet life cycle defines how a servlet is loaded, instantiated, initialized and handles requests from the clients. In the method init, the config object is an instance of ServletConfig class. The config object contains initialization parameters and a ServletContext instance. The initialization parameters are specific to each servlet and configured in the deployment descriptor as part of the definition of the servlet. After initialization, the servlet is able to handle client requests. The servlet engine stops a servlet by invoking the servlet’s destroy() method. The destroy() method runs only one time during the lifetime of the servlet and this is the end of the servlet. After a servlet’s destroy() method is invoked, the servlet engine unloads the servlet, and the Java virtual machine eventually performs garbage collection on the memory resources associated with the servlet. Following three methods are known as servlet life cycle methods. Why Servlet is different from traditional Java program ? If you write a ‘traditional’ program and run it , then it is cleared from memory when you finish running it. It does its job then exits. And so it is with a java program that you run from the command line under the java command. A servlet is just a JAVA class. And we know how to write a java class as bellow. But in case of servlet, the class should be a subclass of javax.servlet.http.HttpServlet . So creating servlet is just creating a class which extends javax.servlet.http.HttpServlet. 2) javax.servlet. *; // This contains classes to make servlet working. 4) Method should throw IOException and ServletException. Depending on the request type, get / post container invokes the corresponding doGet() or doPost() method. doGet is the default method. 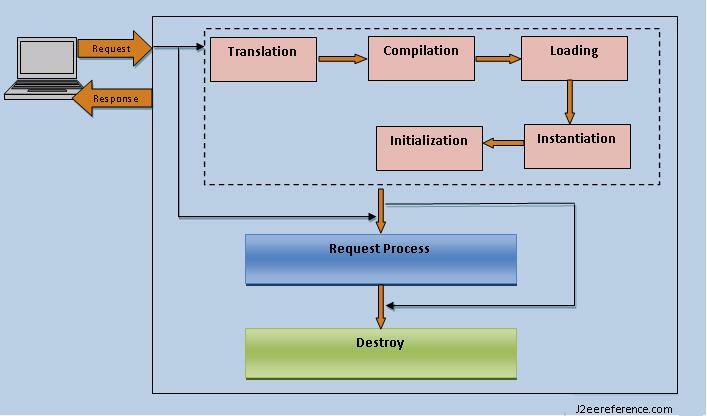 This default method could be called by the following ways. 2) User enters a URL into the browser’s address bar. Following are the difference between doGet and doPost method. 1) In doGet user entered information are appended with the URL. But in case of doPost information will send as form. Hence if you want to send some sensible data like user name and password doPost is the preferable method for security reasons. 2) doGet request can be use for bookmark as it uses URL but doPost can’t be used as bookmark. 3) GET has restrictions on the size of the parameters sent. While Post doesn’t have the size restriction.